Astronomers are using the NASA/ESA Hubble Space Telescope to study auroras—stunning light shows in a planet's atmosphere—on the poles of the largest planet in the Solar System, Jupiter. This observation programme is supported by measurements made by NASA's Juno spacecraft, currently on its way to Jupiter. The extraordinary vivid glows shown in the new observations are known as auroras. They are created when high energy particles enter a planet's atmosphere near its magnetic poles and collide with atoms of gas. As well as producing beautiful images, this programme aims to determine how various components of Jupiter's auroras respond to different conditions in the solar wind , a stream of charged particles ejected from the Sun. This observation programme is perfectly timed as NASA's Juno spacecraft is currently in the solar wind near Jupiter and will enter the orbit of the planet in early July 2016. While Hubble is observing and measuring the auroras on Jupiter, Juno is measuring the properties of the solar wind itself; a perfect collaboration between a telescope and a space probe. "These auroras are very dramatic and among the most active I have ever seen", says Jonathan Nichols from the University of Leicester, UK, and principal investigator of the study. "It almost seems as if Jupiter is throwing a firework party for the imminent arrival of Juno." Not only are the auroras huge, they are also hundreds of times more energetic than auroras on Earth. And, unlike those on Earth, they never cease. 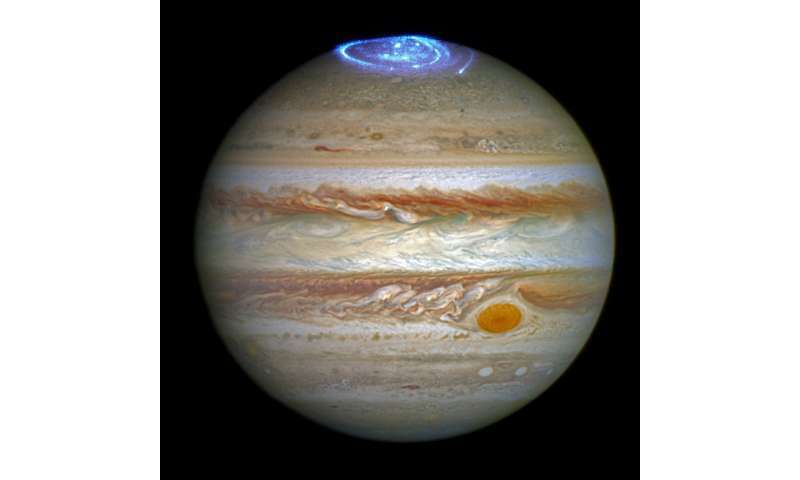 Whilst on Earth the most intense auroras are caused by solar storms—when charged particles rain down on the upper atmosphere, excite gases, and cause them to glow red, green and purple—Jupiter has an additional source for its auroras. The new observations and measurements made with Hubble and Juno will help to better understand how the Sun and other sources influence auroras. While the observations with Hubble are still ongoing and the analysis of the data will take several more months, the first images and videos are already available and show the auroras on Jupiter's north pole in their full beauty.